Jay Kinghorn's Blog | Why does ACR have Orange & Purple along with RGBCMY? I recently received a question from one of my Lightroom Webinar attendees wondering why Adobe Camera Raw uses colors like aqua, orange and purple in the HSL panel instead of sticking with the standard red, green, blue, cyan, magenta and yellow? Although I can’t say definitively, I suspect the answer to the question lies in the organization of the HSL color mode. Like the RGB color mode, which uses three points (red, green, blue) to describe any color, the HSL color mode defines colors based on their hue, saturation and luminosity or lightness. Once you understand how the color model works, it is very intuitive for making corrections, which is why the HSL panel in Lightroom and Photoshop is among my favorite color and tone correction tools. Hue: The colors around the color wheel are identified by their hue angle, listed in degrees, like a compass. 0-degrees points toward the top of the circle and refers to red. A hue angle of 200 degrees refers to a bluish green. Saturation: The Saturation listing refers to the intensity or purity of the color. Listed from 0-100, a Saturation of 0 would be a point in the center of the circle; a Saturation setting of 80 refers to a highly saturated color toward the outer ring of the circle. 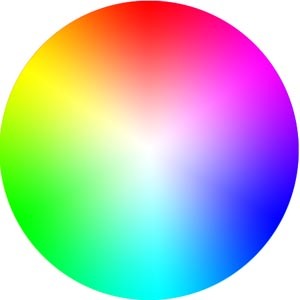 Lightness: While most color wheels are shown as a flat disk like the one above, the HSL color model actually refers to a cylindrical range of colors. Hue and Saturation describe points on the flat disk and the Lightness defines the third dimension, or the lightness of the pixel on a range from black to white. Together, these three color attributes allow you to define colors very precisely. In Lightroom and Photsohop, you can adjust these three attributes in a way that allows you to darken blue skies, warm skin tones or adjust the color of grasses and leaves, independent of the rest of the image without the need for layer masks or selections. Back to the HSL panel. If you divide the 360-degrees of the color wheel by the 8 control points, each slider is responsible for controlling a 45-degree hue-angle. Each of these 45-degree slices corresponds with the named slider in the HSL panel. Now that you know how HSL works, give it a try. I bet you’ll be surprised with the degree of control you have over your images.